.The History of the Belgian Air Force During the Second World War. This Air Forces of the World during World War I and II site owned by John McLeod. This is a brief page on the Belgian Air Force during the Second World War. This page might not have all the information you want because there are hardly any resources out there. If you have a web page I'd be honored if you made a link to this site on it. I would like to thank Diane Top for giving me information for this page. "We shall defend our island, whatever the cost may be. We shall fight on the beaches, we shall fight on the landing grounds, we shall fight in the fields and in the streets, we shall fight in the hills. We shall never surrender." In April 1919 the Aviation Militaire (Belgian Air Force) had eight squadrons, three of them fighter squadrons, including these types of aircraft: Harriot H.D.1s, Sopwith Camels, Nieuport XVIIs, Spad VIIs, and Fokker D. VIIs. In March of 1920 The Aviation Militaire became the Aeronautic Militaire, and the flying school at Etampe moved to Juvisy. After these changes the Aeronautic Militaire started a build up. Between 1922-31 SABCA (Societe Anonyme Belge de Constructions Aeronautique) built an interesting collection of foreign aircraft. The build up included 30 D. H. 9 (1922-23), 87 Nieuport-Delage 29C-1 (1924-26), 45 Ansaldo A.300/4 Reconnaissance Bombers (1923-26), 20 Morane-Saulnier Parasol (1923), 21 Arro 504 K Primary Trainers (1923-27), 15 D.H. 4 (1926), 40 Bristol 17 F2B Mk.IV (1926), 39 Avia B.H. 21 (1927-29), 146 Breguet 19 (1928-31). Sometime in the 1924-29 period the Aeronautique Militaire acquired 98 aircraft from foreign sources of similar types. The Aeronautique Militaire eventually got to 8 groups containing 29 squadrons (4 Balloon station, 6 observation, 4 Army cooperation, 5 Fighter, 3 reconnaissance, 4 Technical, and 3 for training). These groups of aircraft were stationed at Zellick, Goetsenhoven, Evere, and the training school squadrons moved from As to Wevelgen. 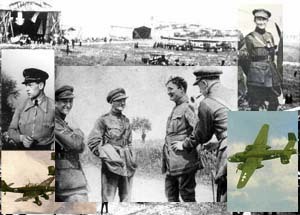 The groups of aircraft turned into 3 regiments in 1926. Because of severe budget restrictions 1 of the regiments was decommissioned, 2 more regiments came at the end of 1929. After that, the Air regiments (still part of the Army) had 1,990 personnel, and 234 first line aircraft (36 of them were trainers). In 1935 Aeronautique Militaire became one of two parts of Commandement de la Defense Aerienne du Territoire' (D.A.T.) (the other the anti-aircraft organization). Because of the budget the staff decided to upgrade aircraft, even though 50 Fox IIIC machines were delivered between 1935-37 and 46 Fox IVR reconnaissance planes came in through 1935-36. Licensed builders (Ateliers Renard in Evere) built 10 R31 prasol-type monoplanes, and 26 others were built by SABCA between 1935-37. Also, 22 Gloster Gladiators were bought from Britain in 1938, 2 FOX VII were ordered in September 1938, and in 1938 20 Hawker Hurricane I fighters were delivered. Then in March 1939 80 Hurricanes were license built. The Belgian Hurricanes were armed with 4 .50 caliber machine guns, though original British design had 8 .303 caliber machine guns. Also the Belgians ordered Brewster Buffaloes from the U.S. On the day of the invasion the DAT had 11 groups containing 73 squadrons stationed at Deurne, Goetsenhoven, Bierset, Schaffen, Nivelles, and Evere Air Force Bases. The First Fiats in Neville with a Fairey Firefly in the front.